Jonah Hoskins, Mary Hoskins, and Grace Kahl were named winners of the 2018-19 Utah District Auditions of the Metropolitan Opera National Council (MONC) held in Salt Lake City on November 17, 2018. Each of the three Utah District winners received a cash prize of $1,500 and will compete with the winners of the Colorado-Wyoming, and Arizona districts at the Rocky Mountain Region auditions. The judges also awarded three encouragement awards of $500 each to Luke Elmer, Sydney Frodsham, and Jesús Murillo. The audience choice award went to Christopher Oglesby. The winner(s) of the Utah District will compete in the Rocky Mountain Region Auditions on February 24, 2019. Approximately 20-25 first place winners from the regions throughout North America receive a cash prize and will be sponsored to go to New York in March for the National Council Auditions Semi-Finals on the Met stage. Up to 11 singers will then compete at the National Grand Finals Concert on Sunday, March 31, 2019 on the Met stage, accompanied by the Metropolitan Opera Orchestra conducted by Carlo Rizzi. 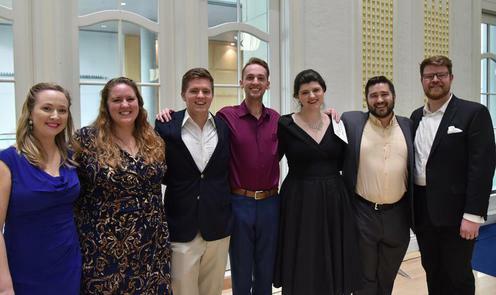 Approximately four to six singers will be named National Council Auditions Winners, each receiving a $15,000 prize and invaluable career-making exposure. Many of the world’s foremost singers have received awards from the National Council and over one hundred alumni of the National Council Auditions sing in Met performances during a typical opera season. Jonah Hoskins, a 21 year-old tenor and native of Saratoga Springs, Utah, is currently a student at Brigham Young University where he is working toward a Bachelor of Arts in music. He has participated in Young Artist programs with Ohio Light Opera, Institute for Young Dramatic Voices, and HGO Young Artist Vocal Academy. He was first place winner of the National Association of Teachers of Singing, Schmidt, and Classical Singer competitions and Gold Medalist of National Young Arts Week. Mary Hoskins, a 26 year-old soprano and native of Saratoga Springs, Utah, earned a Bachelor of Arts in vocal performance from Brigham Young University in 2018. She has previously been chosen as a Utah District Winner (2016) and Encouragement award winner (2017) as well as first place winner of the National Association of Teachers of Singing Utah District Competition, was the 2017 BYU Singer of the Year, and received the Deborah Voigt Award at the 2016 Utah Vocal Arts Academy. Grace Kahl, a 28 year-old soprano and native of Queens New York, earned a Master of Music and Artist Diploma from the University of Cincinnati College-Conservatory of Music and a Bachelor of Music at Queens College. She is currently a Resident Artist with Utah Opera where she was featured in Candide and will perform as a soloist in the Messiah Sing-In with the Utah Symphony and will sing The Rose in The Little Prince and Papagena in The Magic Flute. She has participated in young artist programs with Des Moines Metro Opera and CoOPERAtive and will be an Apprentice Artist with The Santa Fe Opera during the 2019 season. Luke Elmer, a 22 year-old countertenor and native of Flower Mound, Texas is a vocal performance student at Brigham Young University. Sydney Frodsham, a 22 year old mezzo and native of McKinney, Texas earned a Bachelor of Music from Southern Methodist University and is working on a master’s degree at Brigham Young University. Jesús Murillo, a 26 year old baritone and native of Detroit, Michigan earned a Bachelor of Music from the University of Michigan, a Master of Music from McGill University, and is currently a Resident Artist with Utah Opera. The MONC Auditions is a program designed to discover promising young opera singers and assist the development of their careers. The auditions are held annually in 12 Regions of the United States, Mexico, and Canada. The Utah District is one of 41 districts within these regions, and provides an opportunity for talented local singers to enter the auditions. Hundreds of volunteers across North America help the Met organize and fund the National Council Auditions in their respective Districts and Regions. They also help the Met raise nearly $500,000 in prize money that the National Council Auditions awards annually at the District, Regional and national levels of the competition. The MONC Utah District Auditions are supported in part by the Utah Division of Arts & Museums, with funding from the State of Utah and National Endowment for the Arts. Additional support is provided by the residents of Salt Lake County through the Zoo, Arts & Parks (ZAP) Program, the Salt Lake City Arts Council, the Arts, Culture, and Events (ACE) Fund administered by the Salt Lake City Mayor’s Office, and the University of Utah School of Music.